Once the keyboard is open, the EPROM chips are easy to identify - they are the only chips on the main board with paper labels. 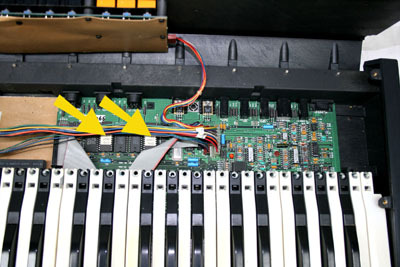 Remove these two chips from their sockets, and simply replace them with the new EPROMs, making sure that (a) the Upper and Lower chips go into the correct sockets (they are labeled on the main board itself), and (b) that the chips are in the correct orientation, with the notch facing the keys (aligned with the notch in the chip sockets). Close the keyboard back up, and you should be ready to go!